Lately I’ve felt like I’m all over the place and yet have little to “show” for myself. And oddly enough, I’m increasingly okay with that. Somehow the seemingly different directions I’m going are all part of what amounts to my vocation. And the “measurable” marks of vocational “success” are most often the temporal things that are not really at the core of what I’m about anyway. I’m still writing, but a lot of my writing time lately is for projects that are months or even years from publication. And I haven’t had any new writing contracts since the work I did for Augsburg Fortress over a year ago. Okay, I admit getting another writing contract is a “measurable” that I do covet. But in my heart of hearts, I want my writing to serve a purpose, to speak grace and love and truth and beauty to people’s hearts. If the contracts aren’t coming through to be able to do that, then I’m just gonna keep plugging away, slow and steady on projects that I believe can do that someday. The big surprise for me this year has been how I have branched out musically. I’ve always loved to sing, but never quite found an instrument I could really make my own…until this year. I got my first guitar when I was 14. I got it to impress a boy I liked because he played guitar. That didn’t work out very well because I wasn’t serious about the instrument and somehow boys can tell these things. Well, I worked on guitar in fits and starts over the years and eventually had to replace my old one. I got a nice Washburn for a good price because it had a “finish flaw.” But I think my Henrietta (the guitar) is beautiful just the way she is. I picked up Henrietta this year to play in a band at the church where I was serving as an interim minister at the time. I was just singing with them at first, but then when they found out I had a guitar, I wasn’t going to hear the end of it unless I started playing too. And since the folks at that church and in that band are some of my favorite people on this earth, it was the safest place I could imagine to try at something I wasn’t too sure about. Two things happened with the guitar that surprised me. First, I was able to recall way more than I expected. And secondly, my coordination improved more quickly than I would’ve ever thought possible. I really can’t stress enough how much the band’s support, encouragement, and gentle advice bolstered my confidence. But as much as I was becoming more comfortable with Henrietta…it was when I bought my first ukulele, Cornelius (named after Yukon Cornelius in Rudolf the Red-nose Reindeer), in April that this music thing got even more interesting. I learned how to play Cornelius really quickly. The band members embracing this new instrumental voice was just the encouragement I needed to really take off with the uke. 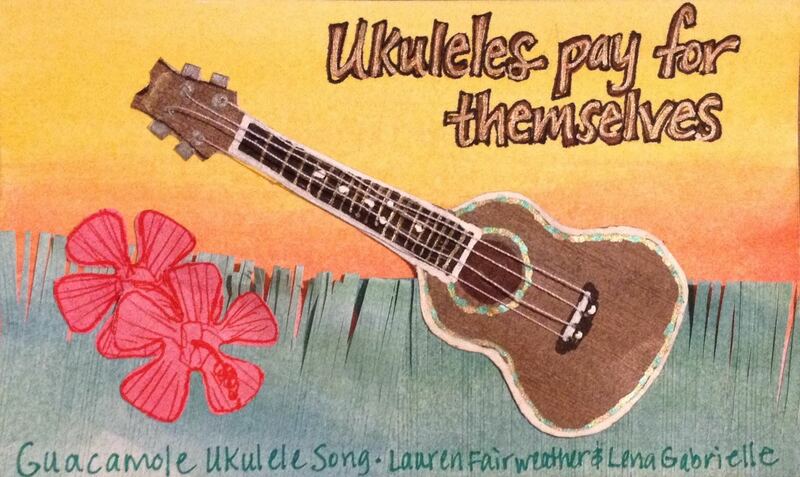 Now, it’s to the point where I feel like the ukulele is practically an extension of myself. It’s pretty cool. With being in the band and playing my instruments and being around music so much, I also got into some songwriting. A lot of songwriting actually. I had written songs in the past, but now with my ukulele confidence, I’m actually playing songs I’ve written in public! And I’m loving every minute of that. I’ve even brought Cornelius into the pulpit with me a few times when I’ve preached and that has been really well received. See what I mean about all these apparently diverging paths all being part of my vocation? And then there’s the art thing. It was my New Year’s Resolution to doodle more and call it art. And I have. And it is. And it is wonderful! Having art as a regular part of my life has been really therapeutic for me in a lot of ways. The process itself has so many benefits. And the products are just getting better and better the more I practice! My big art adventure was in June & July when I took the Index-Card-a-Day challenge hosted by Tammy Garcia of Daisy Yellow. The deal was that we were supposed to make art on an index card every day during those two months. Tammy provided daily prompts and lots of inspiration and encouragement. And I am proud to say that I met that challenge! I’ve been posting my doodles/art on social media and I have been really surprised at how many people have told me how much they enjoy my art. Some of it has distinctively Christian themes, but some of it just happy or silly or just abstract. But it is connecting with people in ways that I would never have expected. And so somehow fulfilling that resolution has been another important component of my vocation. So, I’m doing a lot of different things creatively and sometimes I’ve worried that I’m ranging too broadly. But somehow all of it has been meaningful, not just to me, but to others as well. Since connecting with people is my main thing, then even as all-over-the-place as I feel, somehow wherever this is that I am is exactly where I need to be.